A kite stuck on a power line. Scottish and Southern Electricity Networks (SSEN) is urging people to play safe near power lines and electrical equipment after an emergency power outage had to be staged, while the kite was recovered. 27 households at St Ola on the Mainland were left without power while engineers removed the kite on March 23. Power went out at 7.49pm and was back online at 8:24pm. Children and parents alike are reminded to be aware of the overhead network as kites, drones and model aircraft can get caught and become a dangerous hazard. Dale Cargill, director of customer operations for SSEN’s distribution network in the north of Scotland said: “Playing with high-flying equipment around power lines can be dangerous. 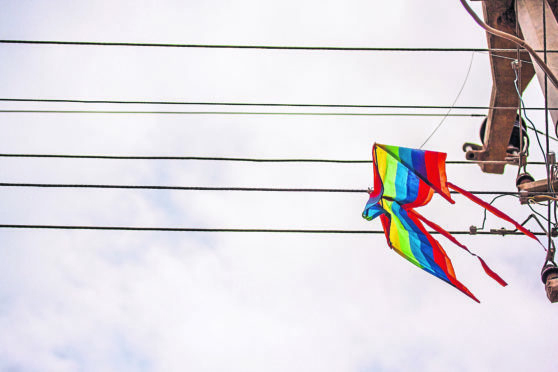 “If you are flying a kite and it gets caught in the overhead power lines, the electricity can travel down the cord and potentially cause serious injury. “Thankfully, a member of the public noticed the kite was stuck and reported it, so we could safely retrieve it and prevent anyone from getting hurt. “As we enter the spring months and people are outside playing for longer, I’d urge everyone to keep a lookout for overhead lines before they start their activity. SSEN has created a series of tips designed to help its customers enjoy the better weather and longer evenings while steering clear of any electrical danger. If a kite, drone or toy is blown towards an electricity line you should: let go of the string or any control wire immediately, don’t attempt to pull the kite free, high voltage electricity can travel down the string; keep yourself and other people well away; and ring SSE’s emergency number, 105 and we will safely remove the toys – make sure you tell somebody as someone else could get hurt by touching it.